RAIN CHECK NOTICE - In New York: IF THE EVENT TO WHICH THIS TICKET APPLIES IS CANCELLED OR RESCHEDULED, THE TICKET DISTRIBUTOR SHALL NOT BE REQUIRED TO REFUND THE TICKET PRICE IF THE TICKET HOLDER IS GIVEN THE RIGHT, WITHIN TWELVE MONTHS OF THE ORIGINALLY SCHEDULED DATE OF THE EVENT, TO ATTEND A RESCHEDULED PERFORMANCE OF THE SAME EVENT OR TO EXCHANGE THIS TICKET FOR A TICKET COMPARABLE IN PRICE AND LOCATION TO ANOTHER, SIMILAR EVENT. For information on what tickets constitute a rain check and rain check policy details: for Citi Field visit mets.com or call 718-507-TIXX; for MCU Park visit brooklyncyclones.comor call 718-37-BKLYN; for First Data Field visit stluciemets.com or call 772-871-2115; for NBT Bank Stadium visit syracusemets.com or call 315-474-7833. Complimentary tickets have no value and will not constitute a rain check. IMPORTANT - Ticketholder agrees that: (a) he or she shall not transmit or aid in transmitting any information about the event or related activities to which it grants admission, including, but not limited to, any account, description, picture, video, audio, reproduction or other information concerning the event or related activities (the "Event Information"); (b) he or she does not own any copyrights or other rights in the event, related activities, or Event Information; and (c) his or her name, image, likeness, voice, portrait, and picture may be used in any broadcast, telecast, photograph and/or video and/or audio sound recording taken in connection with the event for all purposes. This ticket may not be used for advertising, promotion (including contests and sweepstakes) or other trade or commercial purposes without the express written consent of the event operator. The license granted by this ticket is revocable and may be terminated by the event or venue operator at any time. All ticketholders are subject to seat relocation. No refund will be made on this ticket except as provided hereon. Tickets are subject to non-refundable service charges. Any resale or attempted resale of this ticket in violation of applicable law violates the license granted by this ticket. Lost, stolen or counterfeit tickets, as well as duplicate, cancelled or invalidated tickets as a result of resale, transfer or otherwise, will not be honored. In New York: This ticket may not be resold within one thousand five hundred feet from the physical structure of this place of entertainment under penalty of law. Prohibited items include, but are not limited to: items larger than 16"x16"x8"; hard sided coolers; cans; glass bottles; hard plastic, metal or open beverage containers (except those that are empty, individual-sized, and reusable); aerosol cans; commercial audio/visual equipment; alcoholic beverages; controlled or illegal substances; laser pointers; noisemaking devices; fireworks; animals (except for service animals); and weapons. Ticketholder consents to a reasonable search for prohibited items. The venue retains the right to determine what items are deemed appropriate for entry. 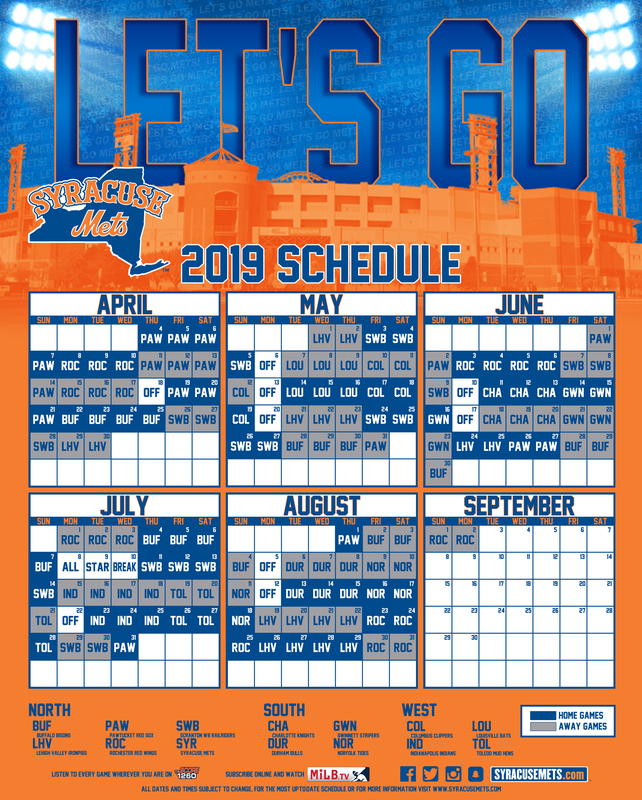 For additional security information visit mets.com, brooklyncyclones.com, syracusemets.com or stluciemets.com, as applicable. WARNING - The ticketholder assumes all risk, danger and injury incidental to the game of baseball or other event and all warm-ups, practices, competitions, entertainment and promotions associated therewith, at all locations in and around the ballpark and surrounding areas and parking lots, whether occurring prior to, during or subsequent to the playing of the game or other event, including (but not limited to) the danger of thrown bats, fragments thereof, and thrown, propelled or batted balls and other objects, and agrees that no persons or entities (including but not limited to Sterling Mets, L.P., Sterling Mets Operations, L.L.C., Queens Ballpark Company, L.L.C., Sterling Facility Services, L.L.C., CF Hospitality, L.L.C., Brooklyn Baseball Company, L.L.C., Community Baseball Club of Central New York, Inc., the City of New York, NYCIDA, St. Lucie County, Onondaga County, the participating Clubs, and their respective agents, owners, officers, employees, affiliates and contractors) are liable for any injuries, death, or loss of property resulting from such causes, and releases and holds harmless all such persons and entities. Any guest concerned with their seat location should contact any guest service representative for an alternative seat location. The use of abusive language, interference with or disruption of the event (including but not limited to throwing objects in the stands or onto the field) or others' enjoyment thereof, entry onto the playing area, and drunken or disorderly behavior, among other things, are prohibited. Violators are subject to ejection, civil penalties, and/or arrest.